In today’s blog I’m featuring all the fabulous vintage clothing and accessories I’ve worn this last week. I usually have this blog up on Sunday evening, but I had such a busy and fabulous day, of which I’ll tell you more about below! I’m also excited to be incorporating video elements, I’ve started making videos of what I wear on a daily basis (videos every few days)! I started off the week with a bit of casual glamour, with lots of work to be done and errands to be run in the city, one of which was seeing my sweetheart at one of his final fittings before deciding which suit he’d be wearing to our wedding in October, which was really quite exciting! Necklace & earrings: Op shop find from Anglicare Morley. On Tuesday I had a rather exciting day, with a rather exciting meeting for a project I’m working on with a few other beautiful people. It can be so hard working on so many exciting things, and having to wait to share with all of you, but I promise exciting things are on their way! Earrings & necklace: vintage pieces that belong to my great grandmother. Top: op Shop find from Anglicare Morley. On Thursday I was one busy bee day! I worked on exciting projects in the morning, filmed a tutorial and had a photoshoot with the very talented Luke Milton Photography! I’m really loving getting up quite early in the morning and being able to achieve so much with my days. Necklace: a vintage piece from my grandmother. Top: a gift from my beautiful friend Jade. I’m very excited to be sharing one of the fabulous photos from my shoot, it was myself Miss Lady Lace as Belle from Beauty and the Beast. I’m working on a Disney meets pinup photo series. I’ll be sharing more of the photos from this day onto my page very soon! Friday’s are always fabulous with my vintage cocktail blog post! I went to my favourite cafe Dome Bassendean and spent some time working on my laptop and sipping some decadent coffee, I truly adore the atmosphere they have, and they’re always playing vintage tunes! Dress: Wheels & Dollbaby that I bought from Bettina Darling. Bra: from the Dita Von Teese Von Follies collection. Jewellery: vintage pieces I inherited from my grandmother. On Saturday another early start with a work out, voting for the Australia Election, rehearsing in my home studio for a performance at a launch on Sunday, followed by lunch with my sweetheart. For the afternoon and evening we had a 30th and a 21st to attend, which I had an absolute ball at, if I’m not performing or modelling on the weekend in the evening I usually enjoy time at home, but going out was a real treat! Cardigan: Op shop find from Anglicare Morley. Brooch: another vintage piece I inherited from my grandmother. On Sunday another bright and early start though I wasn’t feeling as fresh as I was out the night before, we attended a wedding expo in the morning as our reception venue was having an open day, it was really exciting to see the room completely decorated and had us so excited for our big day! In the afternoon I attended and performing as a part of the Bettina Darling launch party, which is a fabulous new online business! A few of my favourite vintage friends were at the event too, it was lovely to catch up with them, and have a look at some wonderful vintage clothing. I of course had an amazing time performing, and was very honoured to play a role in this special day for this new company! Faux fur cape: op shop find from Anglicare Morley. I’m very thrilled for where my vintage fun is taking me this week. Be sure to stay tuned as I have so many glamorous blogs to share with you this week! 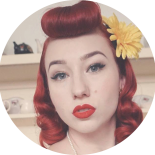 This entry was posted on July 5, 2016 by Miss Lady Lace in Pinup, Vintage Fashion, Weekly Vintage Attire and tagged 1940's, 1950's, blogger, glamour, miss lady lace, miss lady laces pinup blog, ootd, perth burlesque, perth pinup, perth pinup blog, perth pinup community, pin up, pinup, pinup blog, pinup blogger, pinup fashion, pinup girl, pinup life, pinup lifestyle, pinup ootd, pinup perth, pinup vintage attire, red lips, retro blog, retro girl, retro glamour, the perth pinup community, victory rolls, vintage, vintage blog, vintage blogger, vintage fashion, vintage girl, vintage glamour, vintage perth, vintage pinup blog, weekly vintage attire.